We are now SOLD OUT for Baja Beer Craft 2015! There will be no tickets sold at the door. We hope to see you next year. Join us for a lively evening to celebrate the Mexican craft beer movement at the first annual BAJA BEER CRAFT tasting event! BAJA BEER CRAFT will bring together some of the best artisan breweries from Baja California with food from the region and live music. Come meet the brewmasters, learn about their craft and try their creations. Chef Chad White (from Común and Craft Pizza Co. in San Diego and La Justina in Tijuana) will be serving up delicious Baja-inspired cuisine. Quino from Big Mountain (“Baby I Love Your Way”) will be playing live music. Beer, food and entertainment all included in the price of your ticket. 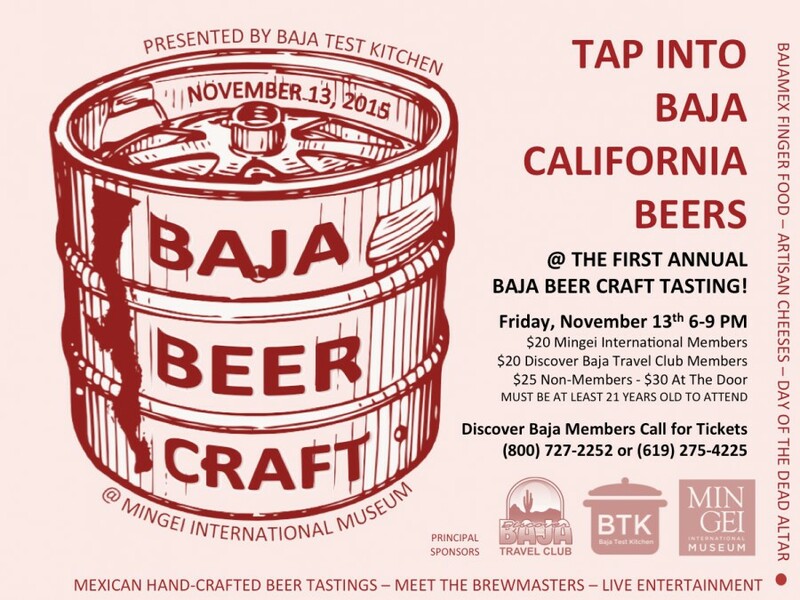 Don’t miss this rare opportunity to try a selection of Baja’s craft beers north of the border! Participating Baja breweries include: Border Psycho, Agua Mala, Wendlandt, Big Bad Berwing Co. (Tres B), Muñeca Prieta, Silenus, Fauna, Peninsula, Legion and more! All attendees of Baja Beer Craft will get free access to the After-Party at Chef Chad White’s Común! $25 Non-members (advance purchase price). $30 At the door for members and non-members (if available). Space is limited so we recommend you purchase tickets early. Must be at least 21 years old to attend this event. Please drink responsibly — do not drink and drive.